Hollywood’s Cold War phase hit its stride in the 50’s and 60’s, but I like the Cold War films from the 80’s – the combination of leg warmers and anti-Soviet stridency just does it for me, I guess – escaping the cinematic Red Menace with help from muscle-bound vigilantes like Rambo or top-secret spy teams, like Megaforce. Unfortunately for the audience, Megaforce is so super-totally-ultra top secret that even the audience isn’t cleared to know what they do, and this makes watching their movie so tough that you wonder if being conquered by the “comrades”Â would’ve really been so bad. Megaforce is supposed to be a special ops team comprised of the best soldiers from every country in the free world, but it’s actually a bunch of guys in tight gold jumpsuits riding little motorbikes in the desert. Their leader is the wild-eyed, long-bearded and small-brained Ace Hunter (Barry Bostwick), who, as Megaforce commander, gets to wear a silver jumpsuit and look like one of the Bee Gees. He gets hired by a British general (Edward Mulhare, aka Devon from “Knight Rider”) to help flush out Guerrera, who’s been helping Commies terrorize some totally made-up country. Wouldn’t you know, Hunter not only knows Guerrera, they used to be good buddies, til Guerrera stole Hunter’s favorite lighter, or something. Anyway, he comes up with some goofy plan to confuse Guerrera with Megaforce’s arsenal of BMX bikes and bad puns. The made-up country’s representative, Zara (Persis Khambatta, the bald lady in the first Star Trek movie), wants to go along on the mission, so Hunter trains her. She passes with flying colors… and then Hunter says she can’t come along anyway. Couldn’t he have just told her that to begin with? So the poorly-defined mission begins, and you’d expect that the movie would focus on exciting military maneuvering or cloak-and-dagger precision. 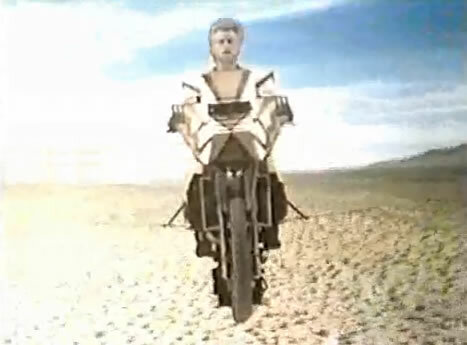 Instead, Megaforce shows us the mind-numbingly tedious side of secret missions. We see guys doing crossword puzzles, taking naps, getting coffee for each other. Eventually they land and blow up their target (whatever it was), but realize they’ve been sold out by the general: their only way home is to attack Guerrera’s tanks head-on with their little bikes and rendezvous with their support plane. They attack the tank drivers with missiles? Rockets? Bombs? No, they use brightly colored smoke! (And the smoke is filmed from a helicopter, so it looks more like an Olympic opening ceremony than a military retreat.) The tank drivers laugh at them long enough for a suitable getaway, only Hunter falls off his bike just as the rescue plane is about the fly away! Luckily, his bike is equipped with a jet pack, and he flies to safety in the most embarrassing-looking blue-screen shot in movie history. “It’s all on the wheel,” Hunter explains, “It all comes around.” I’ll have to take his word for it, since I can’t make sense of the movie on my own. Still, it’s a worthy addition to the Cold War canon – it’s not like “The Manchurian Candidate” had flying motorbikes. Recommended.